I needed to get that Silver Shatter off my fingers ASAP, and for a picture of what OPI’s Silver Shatter looks like check out my OPI Pirates of the Caribbean Collection post. I love matching my polish to my mood and the fact that its May 4th 45 degrees has put me in a bad mood … So I took my nails to a dark place with me! 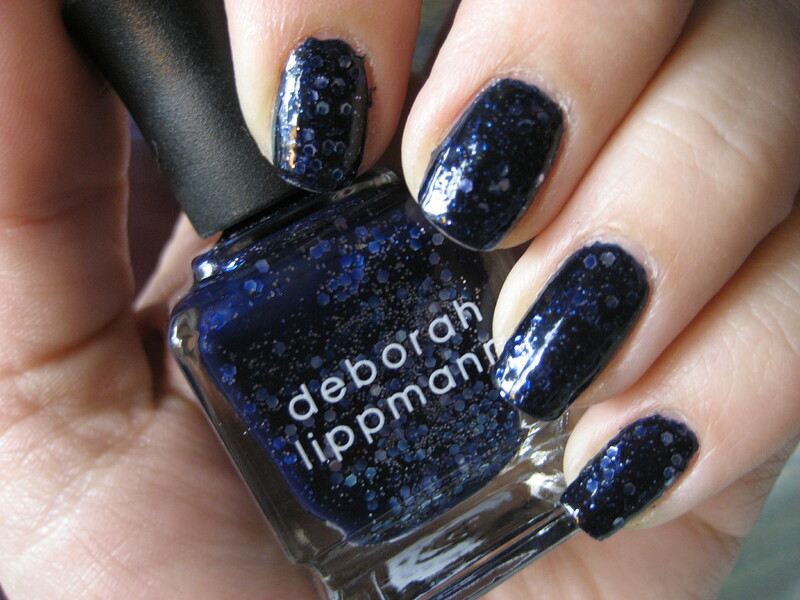 Deborah Lippmann’s “Lady Sings the Blues”! This navy jelly packed with huge pieces of blue glitter is so much fun. I am a huge Deborah Lippmann fan, in my eyes her glitter polishes are the best by any company, and I don’t even mind the price tag that comes with a DL. Formula and Application: I don’t know for sure if Deborah Lippmann polishes are 3-Free or 4-Free. I googled that for about 30 minutes before I gave up. Its some amount of bad chemical free. The bottle is a perfect square, glass bottle, with a blue cap and skinny long brush. The formula is pretty thick and the best way I’ve found to get the best amount of glitter is to just wipe polish off one side of the brush. Its harder to get a clean manicure with these glitters because of the amount of glitter, it tends to not be even around the cuticles. The dry time is a little long, but I found that I was being so careful with the application of the first coat that it took me a while to finish. By the time I had finished both hands, the first finger I painted was dry. It is so tightly packed with glitter that after you apply 2 coats the layering effect of the navy jelly and the glitter is breathtaking. It is totally worth the work to get the right glitter placement and the right coverage. You do have to be careful with the tips of your nails as well as the cuticles because if part of a piece of the chunky glitter extends over the tip (even slightly) you are going to have a sharp little edge. What I would do is when the polish was tacky I would lightly run the tip of my index fingers over the tips of every nail to make sure their was no glitter extending past my nail. You could get away with 1 coat, but I did 2 and love the depth it gives! What do you guys think? Does anyone own any DL polishes and if you do what is your favorite?